We can all stop freaking out now. An 11-month-old red panda named Rusty vanished from the Smithsonian National Zoo in Washington, D.C., but was found in a nearby neighborhood a few hours later. The Smithsonian National Zoo in Washington, D.C. announced Monday morning that they were looking for an 11-month-old red panda who vanished overnight. The red panda, named Rusty, arrived at the zoo last month from Lincoln, Neb., and made his D.C. debut in the Smithsonian's Asia Trail habitat two weeks ago on June 10. The Smithsonian's National Zoo is missing a red panda, a male named Rusty. He was not in his exhibit this morning when keepers went in to feed the red pandas, and we are not sure how long he has been missing. He was fed and cared for last night at 6 p.m.
Red pandas are arboreal, territorial animals. They prefer to stick very close to their home range, which in Rusty's case is his exhibit. Red pandas typically spend the warm daytime hours resting or sleeping up in trees. Most likely, Rusty is napping hidden in a tree somewhere in or very close to the Zoo. Animal care staff has been carefully combing the trees around Asia Trail and the upper half of the Zoo since 8 a.m. this morning. However, there is a chance that he's gone further afield, either because he is sick or scared. It's also possible that someone has taken him. We're asking for your help in keeping an eye out for Rusty. But remember that red pandas are wild animals. They bite when cornered or scared, and even ours are not used to being held or picked up. If you do see Rusty, don't attempt to approach or trap him. Stay where you can safely keep an eye on him and call 202.633.4888 and alert the Zoo immediately. Try to keep him in your line of sight until Zoo officials arrive. Red pandas have the same fire-red fur as a fox, with a long, banded tail. They have white faces with large, pointed ears, and weigh about ten pounds. 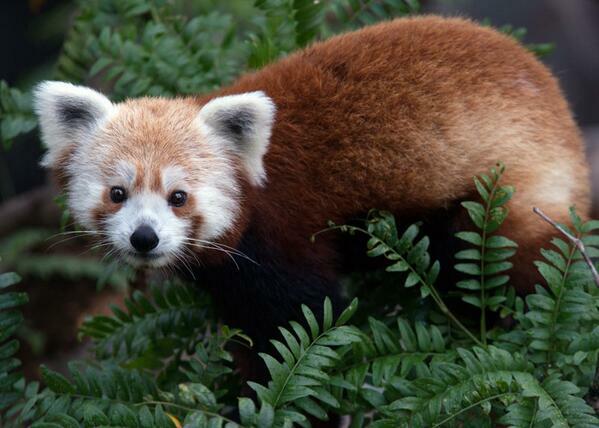 The National Zoo also tweeted about the missing red panda, asking D.C. residents to keep an eye out for Rusty. We are looking for a missing red panda, a male named Rusty. He was last seen at 6 p.m. last night. Animal care staff have been combing the trees around the Zoo since 8 a.m. He could be sick &amp; hiding, or someone could have taken him. Animal care staff have been combing the trees around the Zoo since 8 a.m. He could be sick & hiding, or someone could have taken him. Please help us keep an eye out for Rusty. Remember: red pandas are wild animals, &amp; will bite if cornered or scared. If you do see Rusty, don&rsquo;t try to approach him. Stay where you can safely keep an eye on him &amp; alert the Zoo (202.633.4888) immediately. If you do see Rusty, donâ€™t try to approach him. Stay where you can safely keep an eye on him & alert the Zoo (202.633.4888) immediately. Red pandas typically spend the warm daytime hours resting, so it&rsquo;s likely Rusty is somewhere in or near the Zoo hiding in a tree. Red pandas typically spend the warm daytime hours resting, so itâ€™s likely Rusty is somewhere in or near the Zoo hiding in a tree. We will keep Twitter and Facebook updated with any new information. UPDATE - 2:15 p.m. 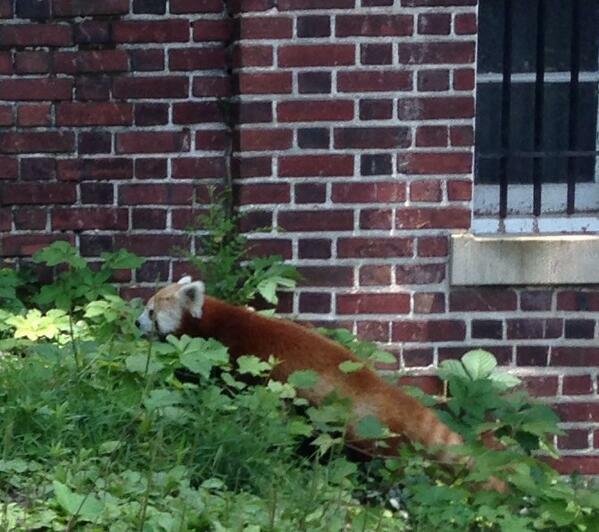 ET: A resident of northwest D.C. appears to have spotted Rusty the red panda! 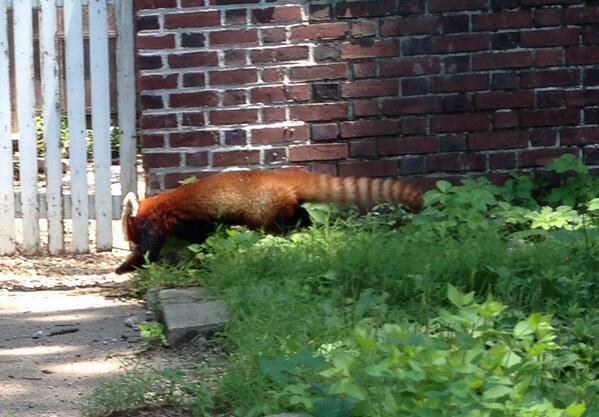 Washington City Paper intern Dan Singer was on the scene as National Zoo officials arrived in the neighborhood to recover Rusty the red panda. Off to the National Zoo to find Rusty the red panda! My guess is that he went to see One Direction last night. They see him! I don&#39;t, but he should be just to my right on a tree. They see him! I don't, but he should be just to my right on a tree. Rusty was crated and transported back to the National Zoo. 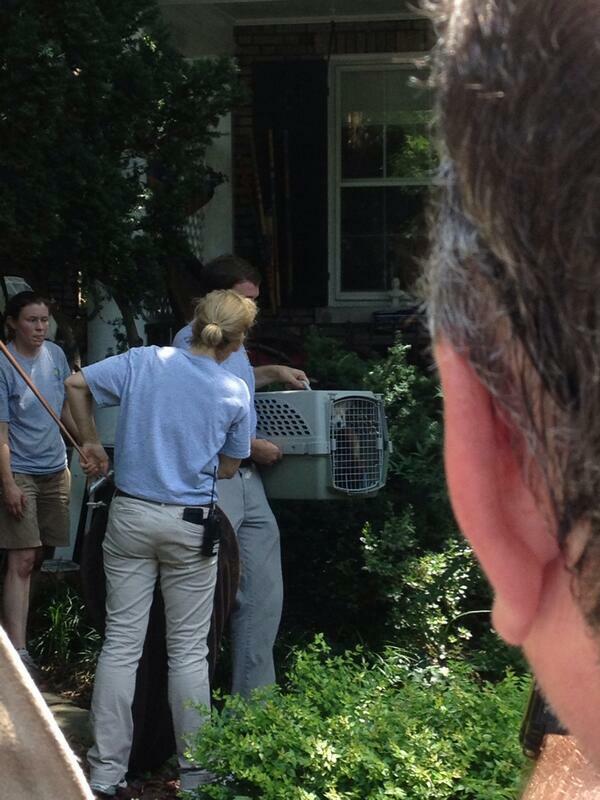 UPDATE - 2:22 p.m.: The National Zoo tweets that Rusty has been recovered and is on his way back to the National Zoo! Rusty the red panda has been recovered, crated &amp; is headed safely back to the National Zoo! Thank you so much to everyone who helped us look for and find him! Now that Rusty's safe, here are some adorable pictures of him in the National Zoo's red panda habitat to make you feel better. See? Everything worked out for the best!